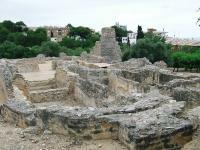 The Archaeological Ensemble of Tárraco (modern Tarragona) reflect the first and oldest Roman settlement on the Iberian Peninsula. It first served as a base for the conquest of the interior and then became a provincial capital. The city has been built on three terraces, adapting to its environments, and included a Forum, Circus, Amphitheatre, villas and other public buildings. 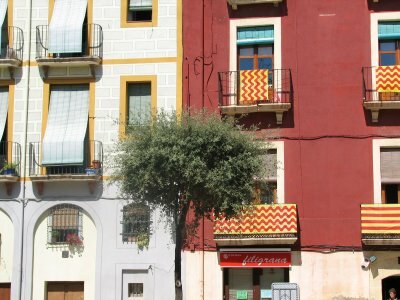 Within Spain, comparisons can be made with Mérida. However, Tárraco is believed to have had greater importance in the Roman Empire, as its first provincial capital. Its remains also illustrate the entire Roman period of the town, from the 3rd century BC to the end of the Roman rule. About 95 km's south of Barcelona, also on the coast, lies the pleasant city of Tarragona. After leaving our car in a parking garage, we tried to find our way to the Roman remains without a map. This wasn't easy, as the city is spread out along the coastline. Fortunately the woman at the train station who had sold out all of her maps pointed us in the right direction: most of the sights are in the north, in the upper town. We walked up there, in the midday heat. The Tourist Information in this part of town holds very Spanish opening hours (closed between 1 and 5 p.m. or so), so we just had to follow our own instincts. The enormous city walls can't be overlooked though. From there we roamed the narrow streets of the charming old town. Most of the Roman remains are only fragments. The amphitheatre is quite complete, but I've seen better ones. It was closed too, for unclear reasons. Not part of the WHS but worth a mention: the cathedral of Tarragona, also in the upper town, is just great. On our way back to Barcelona (via the A7 toll road) we had a glimpse of the Roman aquaduct. If you're in the mood, there's a small parking lot on both sides of the road from where you can have a good look and take pictures. We'd had enough however after another satisfying day. Advise for future travellers to Tarragona: bring your own map and take your time! An attractive city to the south-west of Barcelona, Tarragona’s claim to UNESCO recognition revolves around its Roman past, as evidenced by a significant number of architectural remains in and around the city. Its long history means that the medieval, Renaissance, and modern architecture coexist with the remnants of Roman glory. 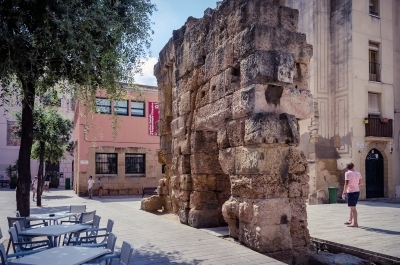 Find yourself in the Plaça del Forum for the best example of that: a standalone fragment of the erstwhile Forum walls surrounded by much later architecture. On my visit to town in the summer of 2016, I stopped by a number of locations named in the UNESCO description. A walk along city walls is both pleasant and educational, with a lot of information about the city history displayed on stands along the path (in several languages, English included). 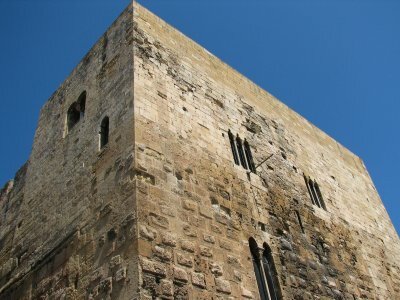 The walls were built up from different types of materials in different eras, fascinating in their own right. I also explored the Circus, with ruins on the ground level and several impressive spaces underground. Amphitheater can be seen from a number of points above it, and I decided to limit myself to the exterior observation. Less than 10 minutes away from the town center is, for me, the most impressive of the surviving Roman monuments, an aqueduct that bears the name of Ponte del Diablo. Walking across it was among the highlights of my trip. The aqueduct sits in a natural park that practically knocked me out with the smells of pine needles and flowers. Nature lovers will find several miles of trails all around the ancient waterway. Tarragona Cathedral is also named in the UNESCO inscription, largely because it dates back to a Visigoth basilica at the same site. Both Gothic and Renaissance elements are prominent in its architecture, which makes for a reservedly decorated and comparatively bright and airy interior, supplemented by colorful window mosaics. The cloister is another highlight, with access to its garden. Beyond World Heritage attractions, Tarragona is a pleasant destination that offers many colorful and picturesque perspectives. One of the most well-known is the incredible mural on the side of a 4-story building on Plaça dels Sedassos, but smaller murals and occasional exuberant decorations are found on many corners and streets. From Barcelona, it is less than an hour of driving to get to Tarragona. Half a day to a full day should be enough to get acquainted with most of Tarragona’s sights, but it is a big enough and lively enough town to support longer stays. Coming from Barcelona Tarragona was the first stop on our trip through Catalonia in May 2014 and we managed to visit all 14 locations of the archaeological ensemble of Tarraco. 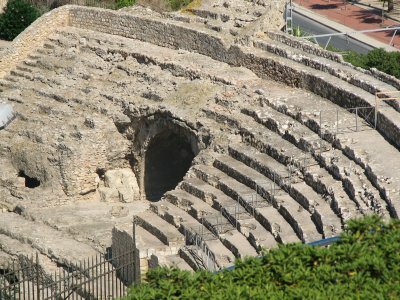 I agree with other reviewers that Tarraco is not a brilliant WHS, there are far better examples of Roman arches, amphitheatres, villas and aqueducts on the WH list. But the special feature in Tarragona is the variety of monuments, there are traces of almost every aspect of an ancient metropolis. In this regard Tarraco is similar to Mérida, but I have not yet visited Mérida, so I cannot compare. A detailed model of Roman Tarraco at its heyday in the 2nd century A.D. provides a good impression of the size and the splendour of the ancient city. The model is shown at the Antigua Audiència (3, Placa del Pallol). First we visited the sites outside the modern city of Tarragona, they are located north of the city and to the east along the route to Barcelona. I liked best the Aqueduct de les Ferreres (Pont del Diable) and the Quarry of El Mèdeol. Both are right off the motorway, you must not pass the toll station. The two-storey aqueduct is less impressive than the one in Segovia or the Pont du Gard, but it is well preserved and we enjoyed to cross the small valley on the top level. There are several ancient quarries around Tarragona, El Médeol (accessible via the Médeol service area) is considered the most striking. 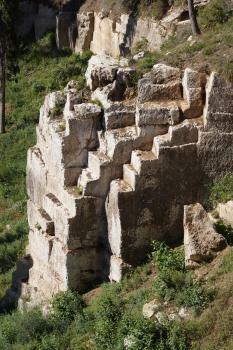 The quarry is about 200 metres long and the almost vertical walls are up to 12 metres high. The marks where the limestone blocks were cut out of the rock are still visible (photo). An impressive stone needle has been left right in the centre of the quarry, so you can try to estimate the amount of stones that were removed from there. A hiking trail with several viewing platforms runs round the quarry, the interior is also accessible. 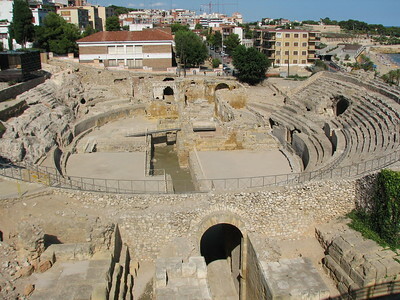 In Tarragona, most of the Roman ruins are located in the upper town, in the area of the medieval city. Noteworthy are the remains of the circus (parts of the vaults and the southern façade), the amphitheatre with its beautiful seaside location, and the early Christian necropolis southwest of the old city. Other parts of the WHS are rather disappointing: the sparse ruins of the Roman theater, the excavations of the Villa Els Munts, or the Villa Centcelles which is just a domed room with fragments of mosaics. Tarragona is a lovely city, we spent two days there and had time enough to visit the beautiful cathedral and to stroll through the streets and squares of the old town - like the Placa del Forum, where you can sit right next to the Roman remains. And in the evening, at our after-dinner stroll, we got a glimpse of an intangible world heritage: the "Castells" or human towers of Catalonia. By chance we came past the training hall of the local "Castellers" and we could watch a training session. Some of the spectators who expertly commentated the exercices tried to explain us the techniques and architecture of the various types of castells - quite complicated but entertaining to watch. I visited this WHS in May 2014. Before heading towards the city proper, I stopped at the Pont de Diablo park (also known as Pont de les Ferreres) to see the Roman Aqueduct. The park itself is in a rather pitiful state although there are signs which state that there should be an EU funded project underway soon to bring the park back to its former glory. The aqueduct itself though has already been restored and it is in good condition. You can also walk on top of it from one side to the other. It's an interesting stop but the aqueduct is definitely not as grand as the Pont du Gard in France or the one in Segovia, Spain. Later on, I proceeded to the city to visit the other inscribed archaeological remains. 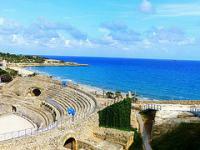 The most noteworthy of them is the Roman Amphitheatre and although it isn't the best I've seen so far, its position in front of Playa El Milagro and the Mediterranean sea make it quite picturesque. I enjoyed my day trip in Tarragona however this isn't anywhere near Spain's best WHS nor is it one of the world's best WHS for Roman remains. I agree that the listed sites within the city are nothing spectacular compared to Merida so I went to search out the sites on the periphery of the city. The aqueduct, known locally as Puente del Diablo, is in a leafy park to the north of the city, reached by bus #5 from the city centre. Whilst it is in a good state of repair it nowhere near as spectacular as the one in Segovia. Centcelles villa is at the village of Constanta, reached by the Plana bus. The main feature is the mosaic design on the domed ceiling of the basilica. Els Munts, located a short walk from Altafulla station, is a rather disappointing excavated village. The Arch of Bera, accessed by a Penedes bus from Torredembarra station, is a rather forlorn and incomplete monument. Today's Tarragona is a very nice and quiet city on the coast just an hour south of Barcelona, and a very easy day trip, due to its great coastal location, medieval city center, and, of course, its Roman remains. Two millennia ago, this was Tarraco, the most important city in the Spanish provinces (and capital of Hispania tarraconensis, the largest province on the peninsula), and it's easy to see why the Romans chose this site for their capital. There are no really outstanding sites here, but what makes Tarragona very interesting and maybe even unique is the fact that it features a complete cross-section of a Roman city - it has an amphitheatre, a forum, a circus, a theatre, temples, administrative and residential buildings, defensive walls, a cemetery, a mausoleum, an aqueduct, and a triumphal arch. Most of these are rather well preserved. I especially liked the circus complex, the forum, and the amphitheatre. Several sites are outside the city centre (some quite far away). Of these, I visited the Tower of the Scipios (a funerary monument, not that interesting) and the Ferreres Aqueduct (locally known as the Devil's Bridge, set in a forest and very well preserved). The cathedral is also very impressive, but was closed when I was there. I have visited Tarragona twice, and my second visit in 2012 was much more exhaustive than the first one in 2005, which was just a brief excursion from Barcelona. I really liked the city, and if you are interested in Roman history, this is one of the better places to experience it. I wouldn't call Tarragona one of the most significant WHS, but is a lovely place to visit. The sites are all in good condition, although the ampitheatre needs some rather unsightly and unnecessary barriers removed, and the forum needs a little tidying. The entrance fees are very reasonable, and you won't be over-run with crowds. The forum was a particularly rewarding experience - I was the only person there! If you're in the area they are well worth a visit.